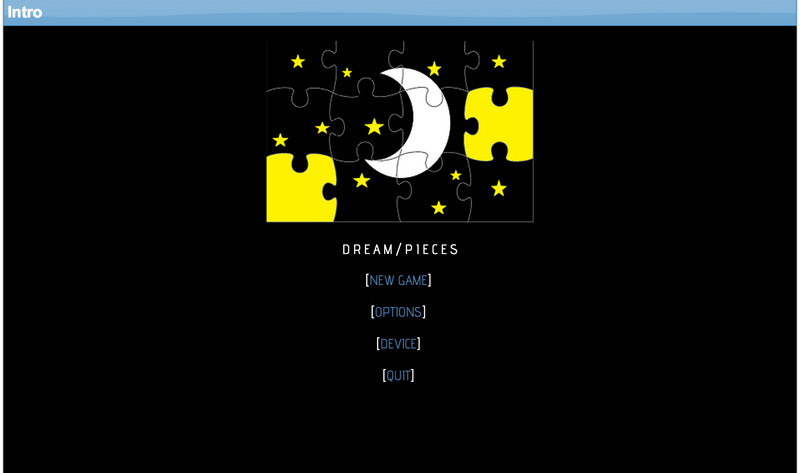 Dream Pieces is a parser-based, low-difficulty wordplay game in Quest, with a room-escape premise. It is on the shorter side (less than half an hour to play). Review to follow; no spoilers. Like many other wordplay games, Dream Pieces takes place in a surreal environment, a dream in which you need to get out of your dream bedroom. You’re also floating in mid-air. Curiously, you’re able to break up objects into their component letters, though some of the letters also disappear in the process. So for instance smashing a phone might give you a “ph” and a “on” to work with, but no “e”. You then “mix” these letters together to reconstitute various words, and when you’re done, you get the new objects to work with. It’s a cute idea, and it’s considerably more accessible than some wordplay concepts: the game is heavy-handed about letting you know what objects you’re going to need to make next, your available inventory is fairly limited, and it isn’t too hard to think through what your options are. The implementation has a few imperfections. You sometimes find that even though you have several copies of the same letter, the game wants you to use a specific one for a particular composition. So mixtures that seem logically like they ought to be perfectly valid turn out not to work, and not to have a very good explanation for why they don’t work. I was also not crazy about the game’s insistence on presenting all output in rhyme. I tend to be extremely picky about anything that presents itself as poetry, especially if it sets up rhyme and meter schemes that are a strain to maintain. Still, despite running into a few snags, I finished the game fairly quickly, and I enjoyed the basic puzzle concept. This entry was posted in Competitions, interactive fiction, interactive poetry, Reviews by Emily Short. Bookmark the permalink. The author now made the rhymes optional from the start menu.